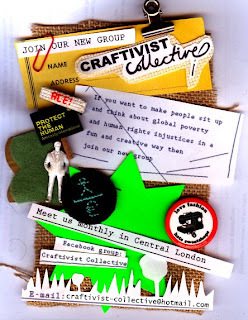 As my lovely followers and friends know, I started up a group in January 2009 to try and meet other like-minded people who would be willing to do craftivism with me. I was really enjoying doing my 'A Lonely Craftivist' projects but wanted to share my joy of craftivism with others and people i knew seemed really keen to join in my projects so i thought why not. Since January the group has been growing in numbers. We now have over 130 members on our Facebook group (and thats without actively searching for people like some groups do), about 15 core active members who come to our monthly planning meetings and at in the last few events we have done we have had between 20 and 70 people participate in our projects. We have also been getting a lot of requests from other groups and individuals who want our group to do workshops, talks, or events with them which is so cool! We have worked with Ctrl Alt Shift, Spitalfields City Farm, Into the Woods Festival and will be working with Sheffield DocFest and Craft Guerrillas in the future. We would love it if you could follow our group blog and comment on that with feedback and constructive criticism to help us grow just like you guys have helped me grow in my craftivism. After all the lovely constructive comments on my blog and in person i recieved from the last cakes project (thanks everyone!) my group Craftivist Collective made new cakes. What do you think? Again, they are made with Fairtrade and organic ingredients (apart from the sprinkles on top like flowers and icing tubes and marshmellows- anyone know where i can get ethical ones?). This time we made tags out of paper and toothpicks. Half the cakes where lemon flavoured so had on the flags on one side saying "fairtrade lemon gluten free cakes". And on the other "Dont let injustice leave a bitter taste in your mouth. Take action against it :)". The chocolate flavoured cakes said 'Gluten free fairtrade chocolate cakes" on one side and the other said said "Most cocoa farmers will never get the chance to afford to experience the taste of chocolate". We sold them at Spitalfields market to raise money for charity. They went down really well and most people were really shocked about our cocoa farmer fact. Plus i got the chance to add to that conversation by talking about my recent trip to Ghana where i met and hung out with lots of cocoa farmers. This one is in a small park near Bishopsgate. It says "It's not enough to be compassionate, we must act." I wanted to have it on a park bench somewhere that a diverse group of people use from bankers to homeless drug addicts. I thought it would be good on a park bench because it might people think about not just sitting and thinking, sympathising or emphathising about people going through injustices and struggles but encourage them to get up from the bench and do something to help their neighbours (local and global) live a better life. On Monday, 24 November 2008 I wrote the blog: have you ever been asked: Do you care? with this badge but a lot smaller. I thought the original badge was too small. but know i think this badge is too big. grrrr.... just cant get it right. what do you think? Ahhh, the joys of Shrink Plastic:) I made these dove badges. I see quite a few people with swallow tattoos on their chests or hoodies with them on and I really like the placement of them. However, I am not quite sure of the meaning behind the swallows. I think it relates back to the Navy. Lots of tattoos and alternative images such as swallows in this placement seem to refer to violence (army, navy, guns, daggers etc) so i wanted to turn that on its head and to doves instead. Doves represent peace and the colour of white makes me think of innocence and purity too. I get asked sometimes why i have doves and its a great opportunity to talk about peace and actively searching for it (hence the green leaf in their mouths that link to the biblical story of Noah's Ark). Everything i make whether as public art (cross stitch graffiti, mini banners, hidden letters etc) or to wear (belts, badges, keyrings etc) I want it to make people think and ask questions so we can have interesting discussions about social justice and peace. can cupcakes make people act? I used to regularly make organic and fairtrade cupcakes with messages on social justice issues. I would sell them on a stall at the back of my lovely ex boyfriends gigs and give the money to charities working on trade justice. I would also have petitions for people to sign and free stickers and badges given to me by NGOs for people to have. I wonder if they will do something or at least think about supporting fairtrade or the climate change issue. Do you think I'm being too optimistic? I told her I wanted to have a mini banner that I could put up in a financial district in London to talk about how this 'depression' should be seen as a great opportunity for banks to think of new ways to make money in an ethical and grassroots way and how their way of trampling on people to make a profit doesnt work! My amazing mother came up with: "THERE IS A GAP IN THE CLOUDS OF UNBRIDLED CAPITALISM, NOWS THE TIME TO ACT FOR SOCIAL JUSTICE"
I love making things and I also have an optimistic view that we as individuals can help the world fulfill its potential. therefore, in my spare time, i try and be a productive craftivist who makes people think about the bigger picture, global poverty and social justice in a non-threatening but thought provoking way. "Pray for the dead and fight like hell for the living (Mother Jones 1830-1930)"